Having a solid customer support system in place plays a huge role in helping you deliver value to your customers and improving their user experience with your brand. And if that customer support system gives your customers a way to reach you instantly (live chat), communicate complex problems to you in detail and be able to track them (ticket support), and look for answers themselves (searchable FAQs page) then you’re all set to make a lasting impact. The good news is that there are a number of high-quality WordPress plugins out there that allow you to implement customer support systems in your website in just a few clicks. With this in mind, in this post, we’ll list down the key features you should look for in a customer support plugin and run the rule over some of the best (free) customer support plugins for your WordPress website. Live Chat Solutions. Your live chat solution should be able to let you respond to your customers via messaging or (optionally) audio/video chat, send files, and store offline messages. FAQ Solutions. The FAQs page you have up on your site should be searchable. Your plugin solution should keep a record of how many times each FAQ was viewed so as to give you some insight into what your customers are unclear about. Ticket Support Solutions. The purpose of a good ticketing system is to issue trackable tickets that let the customer know what stage their problem/request is at. Now that you have a pretty good idea about which features a good customer support solution offers, let’s dive right into our top picks. Customer support plugins come in all different shapes and sizes. Some offer complete support solutions that give you a little bit of everything while others are focused on offering functionality for specific support channels. In this section, we’ll take a look at some of the best customer support plugins available in the WordPress Plugin Directory, highlight their standout features, and give you a quick peek of their configuration options. The WP Support Plus Responsive Ticket System plugin enables users to add a responsive, ticket support system and FAQs section to their WordPress website. Once you have the plugin set up, you’ll be able to receive tickets from your customers complete with file attachments. 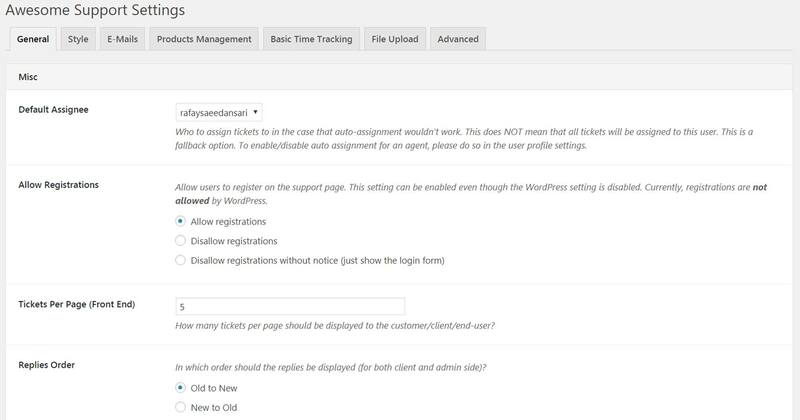 The plugin lets you configure and customize everything from creating required fields on the support tickets to assigning agent capabilities and personalizing email responses. The WP Support Plus Responsive Ticket System plugin is incredibly powerful and offers everything you could possibly need in a ticket support system. Its built-in Statistics section makes it easy to keep track of how many tickets are opened/pending/closed and which tickets are assigned to which agents. Allows customers to attach multiple files. Built-in statistics section gives you a quick overview of all tickets. Send customized email responses for successfully submitted tickets. The Ultimate FAQ plugin enables users to created unlimited FAQs and FAQ categories on their WordPress website. You can embed your FAQs individually or as a whole to posts/pages using shortcodes. After you’ve installed and activated the plugin, you’ll be able to add FAQs the same way you add new posts. The plugin also lets you create FAQ categories and tags to your FAQs. As far as plugin settings go, Ultimate FAQ lets you configure general display settings and import/export FAQs. In addition to this, the plugin also features a dashboard tab that gives you a summary of how many FAQs you have created, how many views they’re getting, and which FAQ has the most views. This little bit of functionality can help you better understand what questions your customers are asking the most. Add searchable FAQs to your posts/pages. Export FAQs to spreadsheets and PDFs. Create FAQ categories and tags. The WP Live Chat Support plugin for WordPress lets you add live chat functionality into your website without having to sign up with a third-party service. Once you’ve activated the plugin, you can head over to its Settings screen to begin personalizing your live chat support module. It lets you configure everything from the plugin’s general settings and chat window settings to how offline messages and surveys are managed. The WP Live Chat Support plugin also keep tracks of any chat messages that you might have missed along with the end user’s name, email, and (optionally) website URL so you can contact them via email. Set up a fully functional live chat module in minutes. Awesome Support adds a fully functional ticketing system to your WordPress website that lets you offer support for a single product or multiple products. After you activate the Awesome Support plugin, a new Submit Ticket page will automatically be created and published to your website’s front-end that allows customers to submit tickets. Once a user submits a ticket, your support agents will be able to view the ticket and reply to it from the WordPress back-end. This feature-rich plugin allows users to fully configure how they’d like their ticketing system to operate. The settings options are quite detailed and pretty straightforward. You’re able to auto-assign tickets to support agents, style your ticket forms, personalize outgoing email notifications, and much more. Choose to offer ticket support for a single product or multiple products. Allows customers to attach multiple files with their ticket. Sends out email notifications to customers for ticket events. 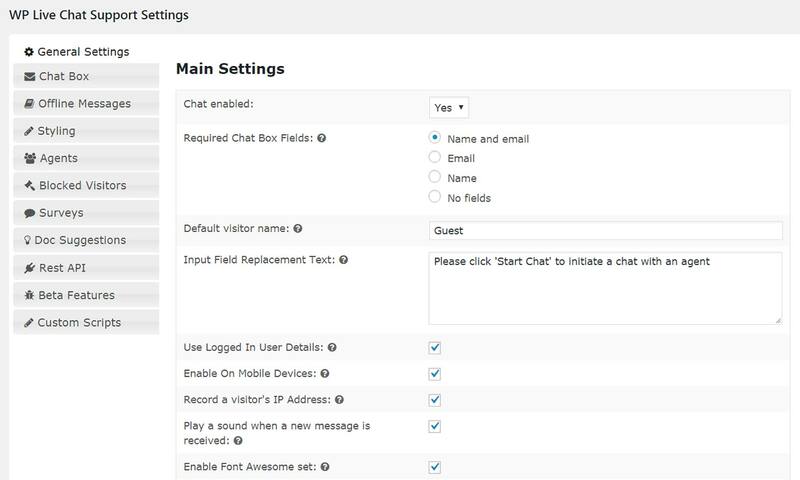 If you don’t mind integrating with a third-party service then Tidio Live Chat just might be the plugin for you. You can use the Tidio Live Chat plugin even if you don’t have a Tidio account – the plugin automatically connects your site to their live chat panel. Once you’ve activated the plugin and accessed the Tidio live chat panel, your live chat bot will automatically be added and enabled on your site’s front-end. You’ll be able to respond to your customers through the panel and use the built-in Quick Responses feature to send prepared replies for frequently asked questions. In addition to this, the Tidio Live Chat plugin lets you customize your customers’ and your own live chat experience by allowing you to style the chat box, enable reporting, manage tracking, conduct pre-chat surveys, and display offline chat forms. Lets you ask customers for feedback. Quick Responses allows you to prepare replies to frequently asked questions. Allows you to choose events to track on your site. WordPress makes it incredibly easy to set up a customer support system on your website. You can choose to go with a plugin that offers a combination of support channels or one that’s focused on a specific support channel. All that’s left to do is decide which customer support channels you’d like to make available for your customers and clients and then implement them with one of the plugins on this list. Which customer support channels do you offer through your WordPress website? Let us know by commenting below!